“We’ve been in here for two months. It’s been fabulous,” says Leo Robertson, a Physical Therapist and Director of the newly-remodeled and expanded Sports Medicine and Rehabilitation Center in Franklin County. The Center, located at 53 South State Street, recently opened its doors and clinicians would love the public to stop in for a visit. 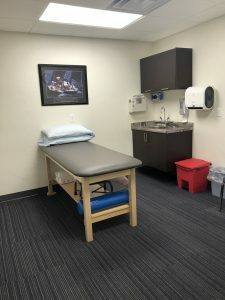 The facility has grown from its original size of 800 square feet to 4500 square feet and was a much needed addition to the Franklin County Medical Center in Preston, Idaho. In addition to the extra space, the Center offers a number of new services. Clinicians are now working with athletes who want specific training to improve agility, strength, and endurance. They are also able to offer extended care to patients who may have exhausted insurance benefits. A total of eight clinicians, including speech and occupational therapists, are working with patients on any given day. The public is invited to an open house on Friday, November 30th from 1 p.m. – 3 p.m.
“We’ll have food and a short program and tours,” explains Allyson Wadsworth, Director of the Franklin County Healthcare Foundation.